North Carolina Needs Jalopnik Brains! You know what's great? You. I mean it— this is not my usual sucking up to the readers before I squeeze out another lame idea I desperately want approval for. By "great" I really should be more specific. I mean "great at identifying cars." 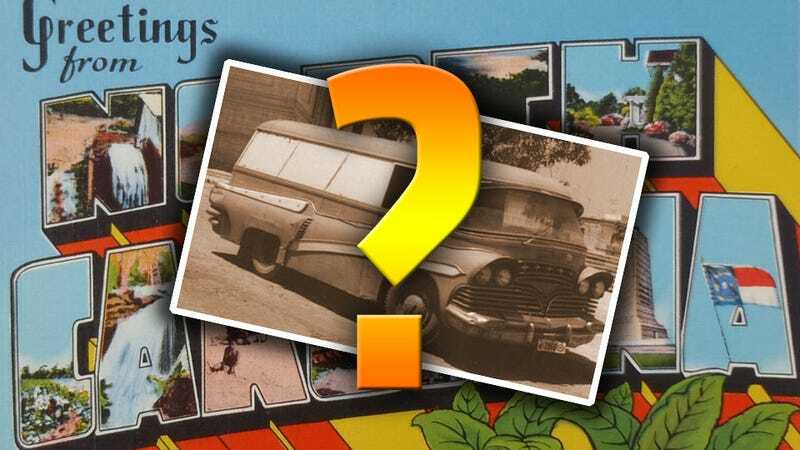 Jalopnik readers have been doing this for police, people searching for their old cars, and more, and as a group, Jalopnik's readers may be one of the best automobile-identifying resources available anywhere. My longtime friend T.Mike must have realized this as well, because he's asked for our help. See, T.Mike works at the North Carolina Department of Cultural Resources, where he spends lots of time poring over boxes of interesting old North Carolina photos. I usually picture him doing so with a gigantic brass magnifying glass in some vast, dim, wood-panelled room lined with shelves. If that's not how it is, I don't want to know. Anyway, after T.Mike found an old photo that had a painfully obvious automotive mis-identification: a 1945 North Carolina photo, and someone ID'd the car as a Volkswagen. There weren't any in the US then. T.Mike came to me, and I correctly identified it as the Buick it clearly was. From there, T.Mike realized that there were many, many photos with unidentified cars, and T.Mike's dedication to, um, knowledge, I guess, means that those cars should be identified. I thought this could be a fun public service for us. Help out the Tarheel state identify cars, and somehow the world is that much a better place. Besides, it may be fun. So, to get started, here's five selections from the archives with cars that need names. Put your findings, by number, down there in Kinja and I'll make sure North Carolina comes by to see the results. Sound good? Anyone have connections to any other state historical societies that need some car-guessing help? This could be a regular thing!